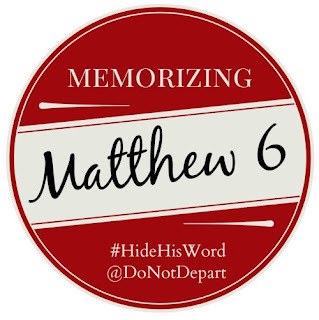 A couple of times per year, Do Not Depart hosts a group Bible memorization. This time around it starts January 11 and ends May 23. Now there are 34 verses in Matthew 6 but there's never more than 2 verses done during any single week. Well, I'm going to to it, and intend to do a Sunday post at the end of each week, to share what I've pondered while reading/memorizing the week's verses. For anyone wanting to start or continue their practice of memorizing verses in the Bible, I do hope you will consider joining in!